Claire Russell was born in Bristol and now lives with her husband and daughter in Gloucestershire. She developed her inherent creativity with a Foundation Diploma in Art and Design, followed by a BA (Hons) degree from the University of Gloucestershire. In 2000 Claire began picture framing as a hobby, framing paintings for her mum, professional artist Christine Russell SWA UA. During this time she also started to design websites for professional artists and art societies, notably, the Society of Women Artists and The Royal Society of Miniature Painters, Sculptors and Gravers. Having completed several specialized courses in picture framing, frame restoration and gilding, she became a professional framer and 2002 she established a studio based bespoke picture framing business. 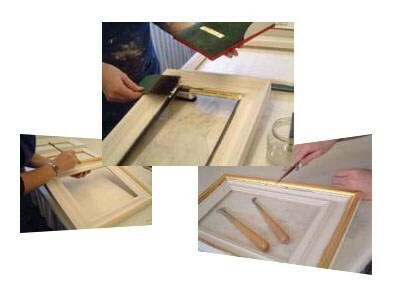 Claire offers a complete bespoke framing service, using only conservation and acid free materials, specializing in framing pastel paintings, restoration work, hand finishing and gilding. She also uses a wide range of specialist glass, so that paintings, prints and photographs are cared for in the best possible way and stand the test of time. You Name it, I'll Frame it!